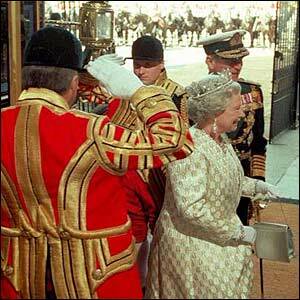 The State opening of Parliament is the most colourful ceremony in the parliamentary calendar. Every element is loaded with historical meaning, some of it dating back to 1536. But the ceremony serves a practical purpose too: Only the monarch can call a Parliament together and no business can take place until the Queen reads her speech. 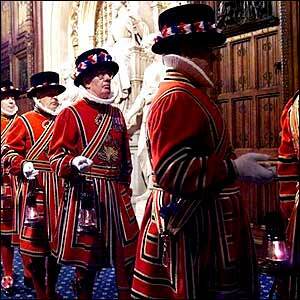 The day begins at 10am when the Yeomen of the Guard � the royal bodyguards otherwise known as Beefeaters � search the cellars of the Houses of Parliament. This tradition dates back to the Gunpowder Plot of 1605 when Guy Fawkes tried to blow up Parliament. Today, officers from the Metropolitan police join the Yeomen in their search. 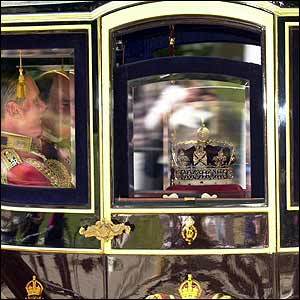 The Imperial State Crown, the Sword of State and the Cap of Maintenance are transported to Westminster by coach ahead of the Queen. 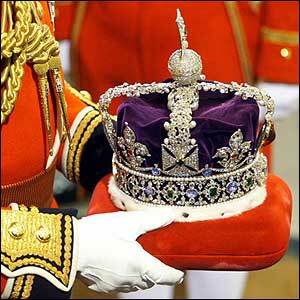 The crown was made for George VI�s Coronation in 1937 and contains the huge Cullinan II diamond and other historic jewels. The Sword of State and the Cap of Maintenance are symbols of royal power. The royal procession, escorted by the Household Cavalry, takes the monarch from Buckingham Palace, down The Mall and along Whitehall to the House of Lords. As the Queen passes under the Royal Arch of the Victoria Tower the Union Flag is lowered and the Royal Standard is raised. Gun salutes are fired in Hyde Park and the Tower of London. 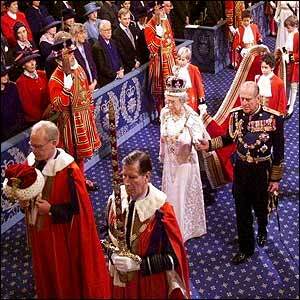 The Queen dons her parliamentary robe and then she and a host of courtiers and officials process to the chamber of the House of Lords. The sword and cap are carried before her. The procession includes the Lord Great Chamberlain and the Earl Marshall who walk backwards ahead of the Queen to show respect. While the Queen is processing, the Gentleman Usher of the Black Rod is dispatched to the House of Commons where he bangs three times on the door with his ebony staff. As a reminder that MPs fought hard to gain independence from the Crown, the door is slammed in his face before he is allowed in to summon them to the Lords. 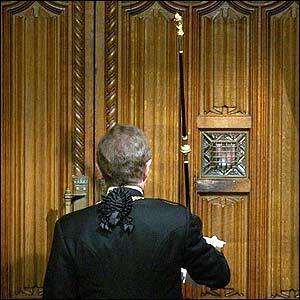 The MPs head to the House of Lords � no monarch is allowed to enter the Commons. 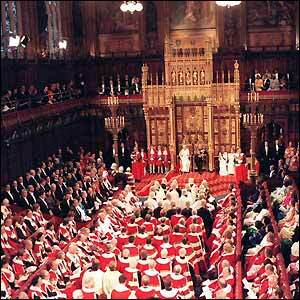 Traditionally, they dawdle and are boisterous in protest that the Lords is still the senior chamber. After the Lords are seated and the MPs are stood in position at the bar of the Lords, the Lord Chancellor hands the Queen her speech. Officially called the Royal Address, the speech is written by the government and sets out its aims for the forthcoming Parliamentary session. 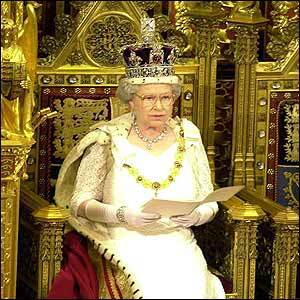 The Queen refers throughout to "My government". The words "Other measures will be laid before you" give the government flexibility to introduce other legislation if necessary.